If your dog is like most dogs, he or she probably spends time outdoors either alone or by your side. Does your pal seem to enjoy the outdoors, or does he stand there panting nonstop? The dog might need some protection from the hot weather. If you can imagine spending any time in the hot sun with a heavy coat or walking barefoot on hot concrete, you can imagine what it’s like for dogs. Most dogs are affected by hot weather regardless of size or breed, but some are affected more than others. A dog’s feet can be extremely sensitive to hot weather. 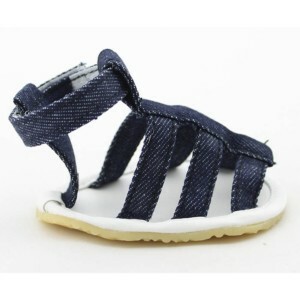 Alldogboots.com offers a great selection of summer wear and booties for your four-legged buddy. Your dog’s paws come in contact with almost everything they come in contact with outdoors, whether it’s lawn care chemicals, pollutants, sharp gravel or hot summer roads. 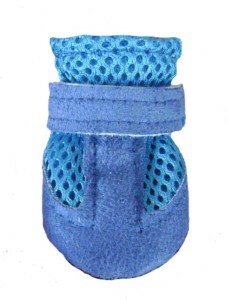 Dog booties can offer protection for the dog’s paws and keep them safe from harmful elements. Your dog may not be too thrilled about wearing boots at first and will probably walk funny at first. However, once the dog gets used to the booties, he or she will barely notice them. The best way to make the dog as comfortable as soon as possible is to make sure you get the best possible fit. Every manufacturer will provide recommendations on how to measure your dog’s feet. Follow these instructions, and you should do fine. Getting the dog the wrong size booties can make the dog uncomfortable or hurt the dog’s feet. If the dog is uncomfortable, he or she might not be too willing to wear them or may try to chew them off. When they’re a good fit, the “wearing in” period goes quickly, and your dog may come to love them. Now that you’ve decided to take the plunge and get your dog summer booties, the next step is choosing the best kind. When choosing dog booties, keep in mind the dog’s breed, activity level, size and any health conditions the dog may have. To make it easier, we've listed 5 of the top dog booties for summer. If you love style and want your dog dressed in style, you’ll love the Zoomies. They come in your choice of pink or blue canvas. 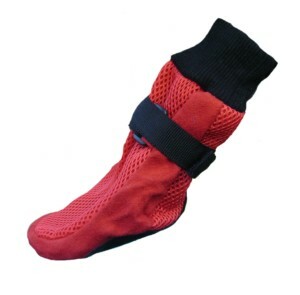 These booties are constructed with sturdy fabric that will last a long time. 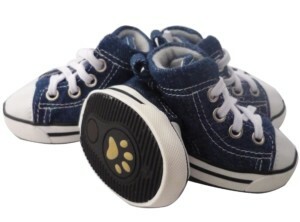 These hi-top “Converse” style dog booties are fun, fashionable and extremely great looking. They secured by laces that go all the way to the top, so the shoes don’t need ankle straps or Velcro. A simple tightening of the laces, tying a bow, and your dog is set to go make a fashion statement. These boots were featured in HGTV Magazine for most fashionable dog footwear! Other features of the Zoomies include the following. If you have any questions about any of the recommended summer dog booties above please contact us. Have a tail wagging summer!